Canada's pigs are about to get a little more breathing space. The National Farm Animal Care Council (NFACC) has introduced a new Code of Practice for the Care and Handling of Pigs that effectively bans the use of controversial gestation crates in which sows are so confined that they are unable to turn around. The code also mandates pain relief during castration and tail docking. As of July 1, mature female pigs must be kept in groups rather than in the small crates. The regulations do allow for animals who have just bred to be housed in individual stalls for roughly one month, but the new regulations require that the pig be able to stand up without touching the bars on both sides of the stall and to be able to lie down without their udders protruding into the adjacent stall. However, the new regulations only apply to new construction or replacement stalls, so the more controversial gestation crates will continue to be used for the time being. Sayara Thurston, a spokesperson with the Humane Society, called the new rules a "watershed moment for farm animals in Canada and throughout North America." "It signals the beginning of the end of archaic, extreme confinement systems that consumers simply don’t support and which other countries have long-since banned," Thurston said in a statement. "There is still much advancement needed to improve the welfare of pigs raised on Canadian farms, but this Code of Practice is a monumental first step." The crates are used to house pregnant or recently-mated pigs. Pregnant pigs have a tendency to behave aggressively. Sows are kept in the stalls during their four month pregnancy and are released to give birth before being impregnated again and sent back to the stalls. The stalls have long been a target of environmental groups. The Society for the Prevention of Cruelty to Animals has called them the most "concerning practice" in Canadian farming, according to the The Province. Last year, Ryan Gosling published a plea for Canada to ban the crates completely. 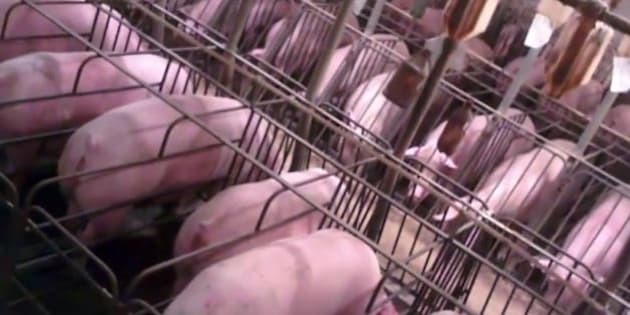 In 2012, non-profit Mercy for Animals released video footage of the conditions at a pig farm in Manitoba that showed exactly what it's like to live in a gestation crate. The video is extremely graphic. The industry was initially hesitant to embrace the new rules due to the costs involved, but now that more and more retailers and restaurants want pork raised in less-confined conditions, farmers are starting to come around. McDonald’s, Burger King, Wendy’s and Tim Hortons have all announced that they will only use meat from more humanely-housed animals. Walmart Canada, Loblaws and Costco Canada have also committed to getting their pork from operations that do not use gestation crates within the next nine years. "Change is not easy," Carolyn MacLaren, the general manager of the BC Farm Animal Care Council, told The Province. "But philosophically this is something that we all agree on. We’re moving in the right direction." The new rules are not the result of Conservative government policy, since the NFACC operates independently. The EU introduced similar guidelines several years ago and many European nations have already moved to ban gestation crates completely. The pig farming industry has come under intense scrutiny of late after an investigation by the Humane Society in the U.S. discovered that sows in gestation crates are being fed the ground-up intestines of baby pigs. In some cases it is possible that the pigs are being fed their own deceased young. An outbreak of porcine epidemic diarrhea in the U.S. and Canada has killed millions of piglets, leading the industry to use them as feed. Still, animal rights groups are celebrating their victory on gestation crates while looking toward the future. Barbara Cartwright, CEO of the Canadian Federation of Humane Societies, described the new rules a "turning point" while calling on farmers to "provide even higher standards than the Code requires."